Who would we recommend it to? This would be a fun book for a pair of besties to read together. Alex and Becca have such a unique friendship, and it would be great to read this book along with a friend and talk about it along the way. 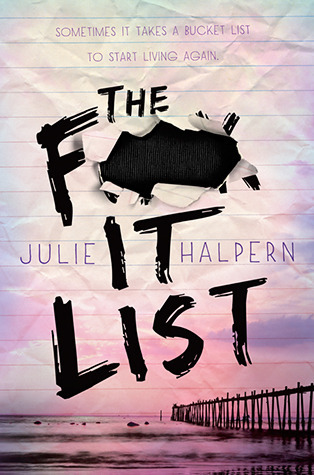 Review: The F*ck It List caught my attention because of its title, of course. I was especially curious to see how it would be listed in our library system’s electronic catalog (The F It List, in case you’re interested). I knew the book’s title would probably ruffle the feathers of a few pearl-clutchers out there, so I wanted to check it out and see if the story was as worthy of attention as the title. The F*ck It List tells the story of two friends who are coping with crappy life situations. Alex’s father had passed away suddenly, and now her best friend Becca has been diagnosed with cancer. The story is told from Alex’s point of view as she copes with these painful situations. Alex is bitter and cynical and wracked with all sorts of teen angst. I thought this could make her annoying as a character, but it definitely does not. Alex’s journey to finding empathy is moving, and very relatable. This book infuses humor into some terrible situations. Although Alex is still grieving for her father and Becca is puking her guts out because of chemo, the girls are always witty. Their lighthearted interactions balance the overwhelming darkness of their personal situations. Now that Becca is sick and unsure of her future, she shows Alex the “bucket list” that she created throughout her childhood and adolescent years. The items on the list range from trivial (eat a hot pepper) to poetic (sleep on a beach until sunrise). Becca asks Alex to do some of the tasks for her, because she will be too ill to do some of them herself. Alex agrees, on the condition that they rename it the “f*ck it list” because Alex does not want to think about the fact that her friend may be ‘kicking the bucket’ because of her battle with cancer. Alex begins the “f*ck it list” with reluctance, but then becomes increasingly more committed to doing the items on the list. She realizes that there’s not much she can do to fight off the bad things that happen in life. Alex can’t go back in time and stop the driver who killed her father. She can’t cure Becca’s cancer. But she can help Becca pass the time during her treatment with stories from the “f*ck it list” adventures, and she can distract herself from the guilt she feels over her father’s death and her best friend’s illness. While all of this other stuff in happening in Alex’s life, she also begins a romantic entanglement with Leo Dietz, a guy she has admired from afar for years. Alex is a pro at hookups without any emotional connection. That’s what she initially tries with Leo, but it quickly becomes more complicated than that. Leo’s brother (a soldier) dies in combat, and Alex must now figure out how to be emotionally supportive for a romantic partner. She’s terrible at it, but she grows as a partner. Alex learns that physical and emotional connections can coexist in a productive way. She was already a sexually confident young woman, and she gradually figures out how to incorporate emotional competence and respect into her sexual relationships. I thought that Alex’s relationship with Leo was the most Slatebreaking part of the book. It was unique in that Alex was the partner who struggled with emotions and initially backed away, when we usually see male characters in that role. Halpern challenged traditional teen relationship roles with the way she wrote Alex and Leo’s story. I can assure you that although this book has death, illness, and plenty of other discouraging elements, it’s really not a depressing book. Halpern weaves in funny moments, ridiculous high school drama, and charming family interactions to keep things light. The overall tone is perfect: thought-provoking without moving into Chicken Soup for the Soul territory. This entry was posted in Reviews, Young Adult and tagged cancer, grieving, Romance, ya. Bookmark the permalink.